The option to customize the context menu in Everything is on my TODO list. 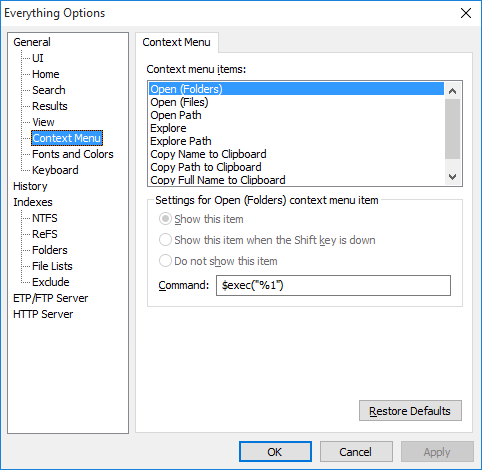 Everything will use the same context menu items found in Windows Explorer. You can modify the Windows Explorer context menu items with the registry editor. This can be enabled from Tools -> Options -> General -> Show folder context menu. From the Start menu, click Run. where c:\Program Files\Everything\Everything.exe is the location of your Everything.exe. Currently my Windows Explorer Context menu is big enough. I would like those items only when using Everything, in Everything context menu. for searching the folder in a New Window of Everything, also might be a solution. What is the planning for this topic? 2. The Dev will add such commands (1. Search folder in Everything 2. Search parent folder in Everything) to Everything Options > Context menu items. 3. Do nothing. The user will have to edit/overwrite an existing command (like explore command). You can already customize the context menu through the Windows Registry Editor. However, I can understand the desire to modify the context menu for Everything only. Right now, the context menu options exist solely so the user can reconfigure Everything to work with a 3rd party file browser without having to modify the Everything.ini. void wrote: You can already customize the context menu through the Windows Registry Editor. Is there a way to rename the context items? maybe tru regedit? 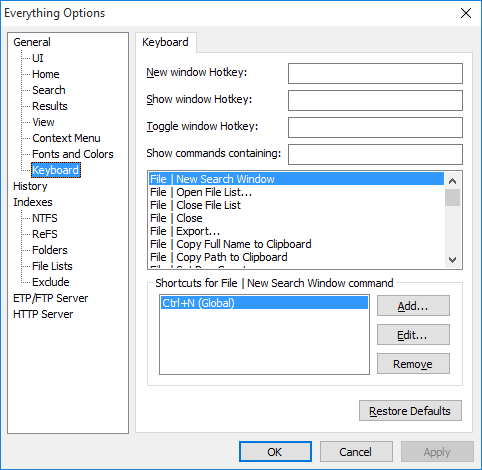 Changing the context menu item name in the registry will change the context menu item name for all applications, including Windows Explorer. If this is the built-in items of Everything (See the pic above, under Context Menu Items:), I think it could be done by editing a trasnlation file of Everything. Unzip your Template.zip to a new folder. Open the Template.txt with Notepad. MENU_COPY_NAME_TO_CLIPBOARD = "Copy Name to Clipboard"
MENU_COPY_PATH_TO_CLIPBOARD = "Copy &Path to Clipboard"
MENU_COPY_FULL_NAME_TO_CLIPBOARD = "Copy &Full Name to Clipboard"
Copy the created Everything.lng to your Everything installation folder. Excellent, that's what I was looking for! In meanwhile, can we have those features (in OP) by adding them to the keyboard shortcuts? Recently I found a way to do this in easy way. It was just there even in the old version of Everything. filelist: might be useful when the user selects multiple files. but not from Explorer but withing Everything itself. You want to view the folder of an item you got in Results - in Everything. Now that this is more explained (hopefully), can I have your opinion, do you agree or disagree with my claim? 1. Add those 2 commands to Context Menu. The OP. 2. Add those 2 commands to the keyboard shortcuts. 3. by Copy/Paste. Copy (Crtl+C) the result and paste it (Ctrl+V) in SearchBox. Now, for the third approach, Everything should know automatically what the user wants. My claim was about the behaviour of Copy/Paste for a single file. I think Everything should know that the user is expecting to have the Parent in SearchBox as described above in 2.b. I think this will be better than the current behaviour. You can keep the "Do not show this item" selected; keyboard shortcuts work with or without the entry being displayed in the context menu. Under Options>Keyboard add shortcut keys for these. In my opinion this is not a primary function for Everything, but *if* it gets implemented, I would suggest a $search() command in addition to $exec(), $openpath() etc. That would make it a little more universal, so the next guy (M/F) could add a "search for duplicates of this file", for example. 1. There is no "Explore" command in the list of Keyboard Shortcuts Options, so I couldn't select a shortcutkey. 2. I tryed also using the Context Menu. The commands you gave seem to work well - they open the correct string in a new window. The problem is that, I'm using currently 2 versions/instances of Everything: 686 and 877 (multiple instances). The clipboard (which is used for Ctrl-C/Ctrl-V ) is "multi-dimensional" (don't know a better word). When you put something on the clipboard (Ctrl-C) this can be done in multiple (clipboard) formats. Can be the filename, the filecontent, the file itself (for copying in Explore), an image .. Or all of them. The (Ctrl-C) application defines which formats will be put on the clipboard. An application can also define it's own clipboard formats. The receiving application (the one where you do a Ctrl-V) has to decide which of those formats is the right one for the context the application is in (or none, if nothing fits). Everything defined it's own clipboard format (filelist:....) for use on the searchbar. This filelist:.. format is (in my opinion) the most convenient when used with multiple filenames. Handling a single file Ctrl-C/V differently would mean defining a new clipboard format especially for this case. Note: This is what I *think* how the clipboard works, looking from the outside. Maybe things are completely different from a programmers point of view .. If a programmer could confirm if this theory is right (or wrong; that would be even better), I would be grateful. That's a pity that it doesn't work. I didn't test it myself (it was just a concept), but wouldn't expect that there was no "Explore" keyboard shortcut. Do things behave better when you disable "Create a new window when running Everything" (Options > UI )? Out of curiosity: why do you use different Everything versions? Is one of the versions better than the other? This filelist:.. format is (in my opinion) the most convenient when used with multiple filenames. Yes. Try this on Single and Multiple folders. One is for using (stable). The other is for testing (Nightly). In this specific case, I have not yet completed the migration to Everything 1.4.